The buzz of the chainsaw sounded like thousands of angry mosquitoes, effectively quashing my quiet afternoon on the deck. I closed my book, glanced over my shoulder toward our adjacent property, sighed, and scooted my chair around to make sure my husband did not cut off an arm or a nose instead of a tree branch. A chainsaw in my husband’s hands turns him into a swaggering, spitting, beady-eyed wilderness-subduer. Unfortunately, he recently located a chainsaw and bought it, against my better wifely judgment; but it was inevitable and only a matter of time. 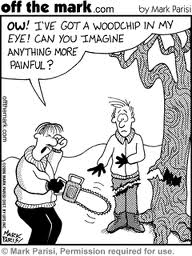 A man that is the owner of a little bit of property in need of subduing is hell-bent on becoming a chainsaw owner. At least my man is. He asked me to go with him to look at the chainsaw, which he’d found on Craigslist. I went, wondering what sort of person would be selling a chainsaw. We drove about twenty minutes north of Westminster on winding, hilly roads, past cultivated fields and acres of baby crops that I cannot name and eventually arrived at a tidy house on a hill. 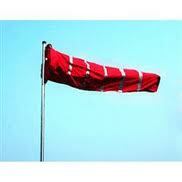 It was a bright, sunny, breezy Saturday morning and a wind sock on the property was perfectly horizontal. Before I had time to consider why anyone would have a wind sock on their property, the chainsaw-owner, who was mowing his yard, interrupted his task and headed in our direction. He was tall, thin and intellectual-looking. As he and my husband connected over chainsaw lore (for which I had no interest whatsoever, other than safety issues) I noticed the man was articulate and interesting and was moving to the City and hence had no need of a wilderness-subduing machine anymore. I guess I had expected a squat, muscular, non-verbal, kind of hairy guy chewing tobacco. A sweat-stained John Deere cap on his head. He would look at us with obvious disdain; spit, ask us if we were serious about buying the chainsaw. Tall, thin, intellectual man: “Yes.” Expectant pause. My husband took this as his cue to give the man a comprehensive background about us, his job, our property and all the reasons he needed a chainsaw at this point and has not needed one before, and why he is looking forward to become a chainsaw owner. The man responds in kind, and I wonder if they are going to bear-hug each other as a nod to past and potential-chainsaw-owner bonding. I resist smiling and look away. My husband: “Sure!” His eyes gleamed in anticipation. They strode over, perfectly united in their maleness, toward said chainsaw. The tall, thin, intellectual man held the (rather small and bright green) chainsaw aloft proudly. My husband paused to appreciate the raw power in his hands. My husband nodded. His demeanor suggested he is something of a chainsaw expert, but not this particular chainsaw. He stepped forward, crossed his arms and resisted touching the chainsaw. Tall, thin, intellectual man: “So you have to push this button about seven times. Then you have to pull this string two or three times. Then jiggle this. Sometimes it starts, sometimes it won’t, but usually it does.” He successfully started the chainsaw, and over the buzz shouted, “I am going to give you the instruction manual! “ Then they shouted at each other about gas and oil or whatever it was that made the darn thing work. My husband reached for the chainsaw as the tall, thin, intellectual man shut it off and motioned my husband to start it. He did. Relief flooded his face. I suppose that to be unable to start a chainsaw that had just been just started would be tantamount to a masculine failure of some sort. I am 58 years old, and still do not understand the complexities of the (largely unspoken) male code. I found it humorous, though, in a cute sort of way. My heart did a little thumpity-thump of adoration toward my husband after he started the chainsaw. We women love the little boy part of our husbands. They walked in lock-step, the buzzing chainsaw between them, in search of something to slice. 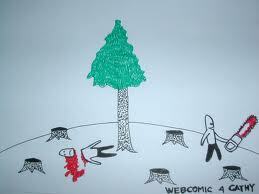 The branch they targeted fell uselessly to the ground, killed by the chainsaw. They smiled at each other. I looked at the wind sock, which was now un-breezed and hung limply, and hoped the men didn’t notice me rolling my eyes. My husband, after felling the branch, looked at me questioningly. I recognized the look as, “Do you think this is a good decision?” I obligingly responded in the affirmative, thinking, what the heck do I know about chainsaws? And, I hope you do not cut a hand, arm, toe or leg off and that I do not have to deal with blood spurting out of a severed limb! I smiled, then, because I knew this is what he expected and to react differently would be to damage his male credibility as a husband-wilderness-subduer-chainsaw-owner in front of the tall, thin, intellectual man. The two men – one a former chainsaw-owner and one a proud, first-time, chainsaw-owner – disappeared into the house and finalized details. They emerged after ten minutes, and we chatted as my husband reverently placed the chainsaw in the trunk like a precious piece of china. We talked about the weather, professions and life’s stuff for a few minutes, and discovered the tall, thin, intellectual man wrote dictionary meanings for a living. I was astonished. 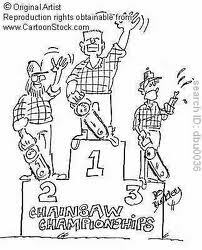 My perceptions about chainsaw owners forever obliterated. If a tall, thin, intellectual, DICTIONARY AUTHOR owned a chainsaw and did not sever a limb or a digit, then I should not have to be anxious about my own husband’s limbs and digits. And I should not fear that he would start chewing tobacco, wearing sweat-stained hats and belching involuntarily. As of this writing, my husband and son have successfully utilized the chainsaw to cut down a couple of small trees and flatten a stump. I have allowed myself a few tentative sighs of relief. Perhaps they will proceed with chainsaw wisdom as they wield the buzzing green monster. I find myself wondering, however, if the chainsaw, when lying dormant in the shed, is plotting to seduce my husband into buying more power tools. 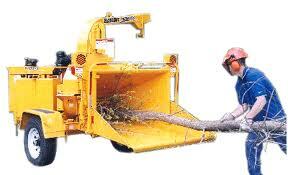 I don’t think I could handle what might happen if he bought a wood chipper.